Clogs were also by the overseers of Darlaston, Staffordshire: in 1818 Thomas Challinor was paid for three pairs. In Skelton, Cumberland, the inventory of Grace Matthews goods and clothes included one pair of clogs. There is a separate blog entry for Matthews. 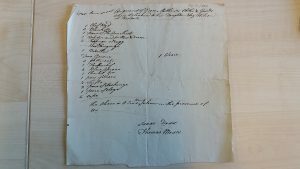 In Wigton, Cumberland, Thomas Watman’s 1773 bill refers to the calking of clogs. Details of two further vouchers from Wigton (1771) and Skelton 1791 are shown below. At Lancaster, Eden noted: ‘Ironed clogs, which are much cheaper, more durable, and more wholesome than shoes, are very generally worn by labouring people’. The noise clogs made alarmed those unused to it. In August 1797 Henry Kitt recorded: ‘We were annoyed at first by the harsh clatter made by the clogs of the boys playing in the street … We were soon, however, convinced that these wooden shoes, capped with plates of iron, were well adapted to the use of the peasants who inhabit a rough and marshy country’.